I managed to get another game in last night, against the Prussians of Than's. I was running my KoB, based around the carrier/battleship combo, I wanted to bring along plenty of air support, surely that will help? 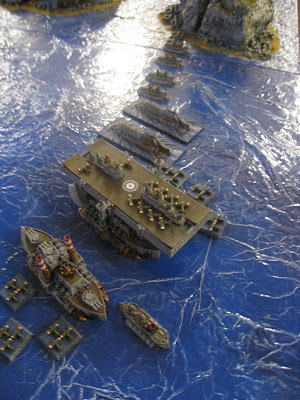 Most of my fleet arrayed ready for the engagement! 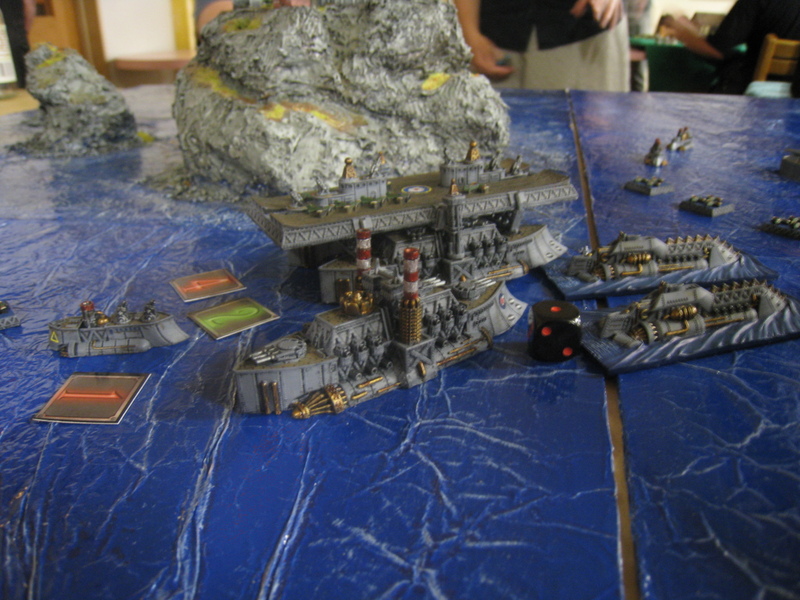 The carrier was the central element of my fleet as last time. 3 Squadron of Frigates engages the enemy battleship, bravely and with honour! The Brittanian Battlegroup nears the enemy, following a tight wedge formation! The Royal Flying Corps (RFC) make their dive bombing runs onto the enemy Battleship class vessel, crippling her, before one of the brave Frigates from 3 Squadron delivered the coup de grace! One of the quirks of Dystopian Wars is the exploding dice mechanic (on a 6 is is 2 hits, plus a reroll), in this case the Frigate with 3 dice, rolled a mammoth 11 hits! Totally absurd, absolutely ludicrous and I apologise to Than for that. 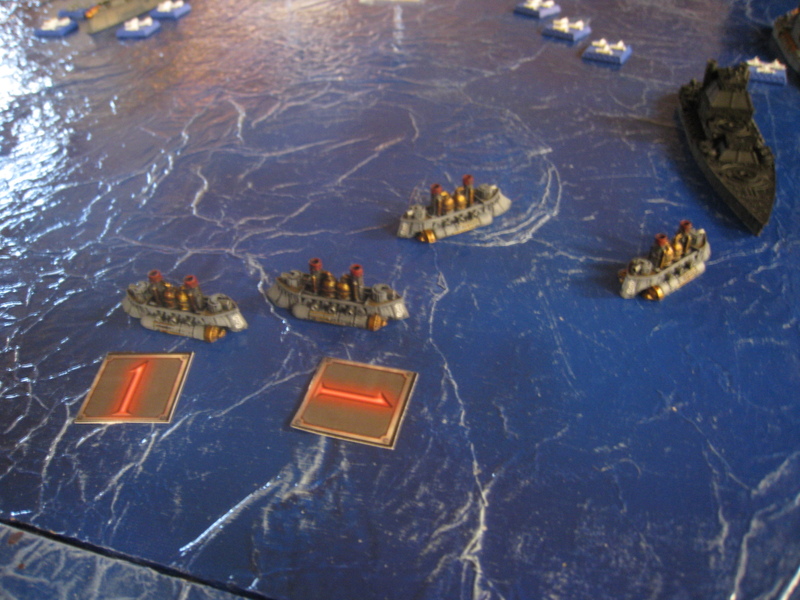 The final moments of the game, where the HMS Achillies as well as her supporting vessels attempt to put some hurt onto the enemy Dreadnought (identified as a Blucher Class vessel) but to no avail! 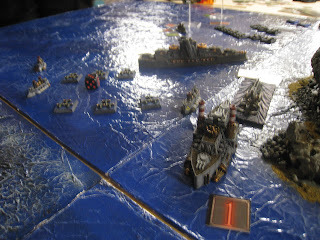 This was a pretty typical game of Dystopian Wars, lots of stuff sailed about and died! Again I had real issues dealing with a Prussian Dreadnought- I am not sure how to handle it, it has too much CC to prevent torpedo strikes, as well as shields to prevent normal gunfire. Not sure, perhaps the only solution is to bring a dreadnought of my own? I ran alot of Aircraft this game (16 tiny fliers, 2 bombers) which did a really good job on one Battleship (once it had lost it's CAP and got damaged so it's AA was reduced), so I can understand why people complain about the planes being super powered on the forums! Well, I have plenty of stuff to paint for a tournament next week, more on that over the weekend! Oh, plus a big Total War game of FOW tommorow! Cheers for a fun game. And you are forgiven for your insane frigate torpedoes - overall I think our luck was about even. Great to see how airpower works. I think tiny fliers are nicely balanced - potentially dangerous (as I found out) but with countermeasures available. 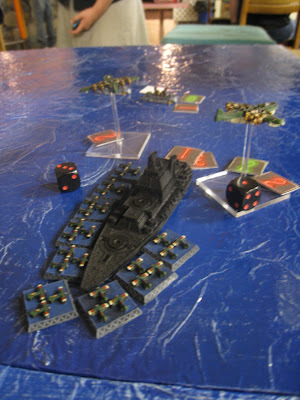 The main limitation seems to be each abort prevents one tiny-flier from contributing dice to the attack. With squadrons of 3-4 a couple of aborts (and even without CAP a battleship's AA 6 will average 2 aborts) cuts down the strength of the attack to only 3 or 6 AD. Bombers were interesting, I will have to play them some more to get a feel for them. My intuition was they would work similarly to fighters, but they were more like light cruisers that just happened to be in the sky. Great looking battle. 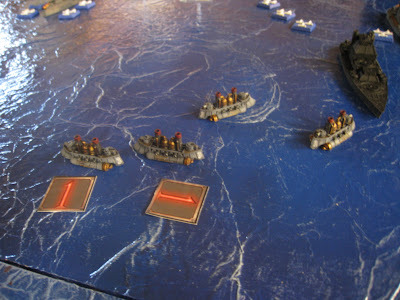 Just starting Dystopian Wars myself. Got my first Prussian vessels on the way.